X-rays play a vital role in dental check-ups. They allow your dentist to view potential problems forming in areas of your teeth and jaw that are not readily visible to the eye. This allows your dentist to catch potential problems early, before they become more serious, painful and expensive. Modern technology has improved the process by introducing digital x-rays. These machines are much safer because they only expose the patient to approximately 10 percent of the radiation of traditional film based x-rays. Patients are often concerned with unnecessary exposure to radiation and request to avoid dental x-rays. While we encourage all of our patients to be their own oral health advocates, it is also important to understand how radiation works and why, when it comes to dental x-rays, the positive outweighs the negatives. Radiation is all around us in our daily environment. Many natural compounds and everyday activities increase our exposure to this background radiation. Examples include coal power plants, using fertilisers, the production of petroleum products and even benign rocks such as granite. Granite contains Radon gas, and it’s use in homes accounts for more than 50% of our natural radiation exposure. In medicine, radiation is measured in Sieverts (Sv). This unit measures the health impacts of small amounts of radiation, and is used to assess and compare the risks from different radiation sources. In Australia our exposure from background radiation is about 2 milliSieverts (mSv) annually. Background radiation can vary worldwide but generally ranges from 1 – 10 mSv, but can be as high as 20 mSv. Many activities increase radiation exposure. For example, a return flight from Australia to London is 0.17 mSv. And a house containing granite flooring and benches would expose the occupants to approximately 1.0 mSv of radiation annually. Even eating bananas measurably increases your exposure to radiation. To put all of these numbers into perspective, a typical x-ray used in a dental check up, for example an OPG x-ray which displays all of the teeth of the upper and lower jaw, exposes you to 0.02mSv (only 1/8th of a return plane trip from Sydney to London). Similarly, Pbws x-rays (posterior bitewings, one for each side of the mouth) which may be used before an extraction, expose you to 0.0025mSv, (the equivalent radiation of eating a few bananas). These figures show that the risk of radiation exposure during dental x-rays is far outweighed by the benefit of the early diagnosis of oral pathology and disease, and therefore the ability to enact more efficient treatment. Problems beginning between the teeth or under the gums would be very difficult to diagnose without the help of x-rays. In many instances of decay, by the time the decay is visible to the eye, a large portion of your natural tooth structure may have been irreversibly lost due to decay. This leads to pain, poorer health, and more costly and ongoing dental procedures. X-rays can also be used to diagnose more serious conditions of the mouth. Tumours and cysts in the mouth and jaw, like anywhere in the body, do not always cause symptoms until they are large and invade other tissues. If diagnosed early they may make treatment far easier and effective when compared to later diagnosis. X-rays are not required as part of every dental check-up. How often your dentist takes them depends on your individual dental history. The first time you see a dentist they will likely take an x-ray on each side of your mouth to view the areas between your teeth, assess bone levels and calculus deposits, and establish a baseline so they can best assess and treat your individual needs. From this baseline your dentist can compare x-rays in the future and identify any issues that need to be treated. This can include impacted teeth, abscessed teeth and any potential pathology that affects the jaw joints. For younger patients an x-ray can sometimes be taken to ensure they have all their adult teeth present and that they are erupting correctly. If you are found to be at a low risk of decay, your dentist should only need to take x-rays every 2-3 years. If you are at a higher risk (ie. you have a history of regularly experiencing decayed teeth; have a dry mouth; heavily restored teeth; periodontal disease and various other factors), they will likely take x-rays every 1-2 years. Usually when the teeth have suffered physical trauma and require complex treatment, more frequent x-rays will be required. Other complex treatments such as root canals and the placing of dental implants also require more frequent x-rays. Despite the minimal risk posed by dental x-rays, you are able to refuse x-rays as part of your dental check-up. 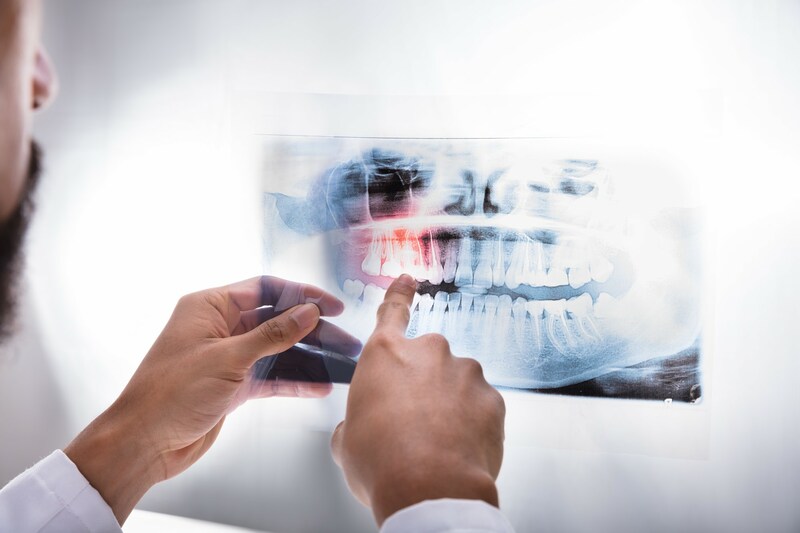 It is advisable, however, that you speak with your dentist about the use of x-rays as part of your oral health treatment in order to better understand why x-rays are a beneficial part of the maintenance of health teeth and gums.